How many others have suffered in silence, afraid of being taken out of the car? The biggest NASCAR news in the last few days has had nothing to do with winning a race, claiming a points lead, or anything like that. Instead, the most popular driver in the sport, Dale Earnhardt Jr., made news that reached far beyond the realm of the NASCAR world and into mainstream news broadcasts on Thursday by announcing that he wouldn’t be racing this weekend and Charlotte Motor Speedway or next week at Kansas Speedway because of a concussion he suffered in the 25-car, final-lap wreck at Talladega (Ala.) Superspeedway the previous weekend. The Talladega concussion was actually the second in about six weeks for Earnhardt. He also suffered a concussion during a test at Kansas Speedway several weeks ago after making hard impact with the wall. The driver never reported the Kansas concussion, and waited a couple of days before seeing a doctor about the Talladega incident. The reason Earnhardt said he finally went to the doctor about the most recent concussion was because he’d had a couple close together. Earnhardt has had other concussions in recent years and continued to race. 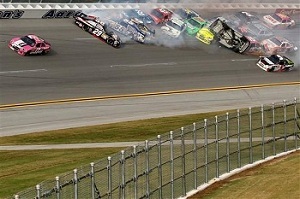 It kind of makes you wonder how many other drivers have raced with similar injuries and simply kept theor mouths shut. There’s probably been several. After all, much roundtable-type discussion over the weekend has included former drivers and they’ve admitted that they probably would’ve just kept silent and kept on driving. Soon-to-be Hall of Famer Rusty Wallace even admitted to being affected for 15 years by a head injury he never had checked out. Drivers don’t want to climb out of their race cars, so if they have to suffer in silence, so be it. Several drivers, both current and former, applauded Earnhardt for stepping up and admitting that something wasn’t right, since it’s, apparently, rare for a driver to come forward and admit to an injury that may take him or her out of a car, at least temporarily. Should NASCAR step in? If so, what should the sanctioning body do? There’s already a rule in place that requires drivers unable to get their cars to pit road or the garage after an in-race incident to go to the infield car center for observation. Earnhardt was available to avoid that when he was able to refire his car and drive it across the start/finish line at Talladega. It’s probably not reasonable for NASCAR to require everyone who makes severe contact with another car or anything else on the track to climb out of the car instantly and line up for observation at the infield car center while his or her car sits, driveable, just outside. Here’s an idea I have for consideration. Maybe NASCAR should require all drivers involved in an incident in a race on any given race weekend head to a doctor to be checked out early the following week. It may seem like a lot of trouble on the surface, but it’s a matter that’s well worth said trouble. 24 Responses to How many others have suffered in silence, afraid of being taken out of the car? to convey that I’ve a very excellent uncanny feeling I came upon just what I needed. I so much indubitably will make sure to do not omit this site and give it a look regularly.